Santa’s list of little children waiting for him to bring them presents is growing! He needs help in ensuring that all of them receive their prezzies. Assist Santa in dropping the gifts through the chimneys, so that by Christmas Eve, you’re fully trained! 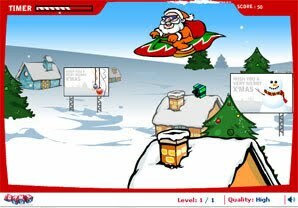 Chimney Drop is nothing but a simple game in which you drop the presents as soon as you spot a chimney. This Christmas, help Santa in spreading the cheer. Press space bar to drop the presents through the chimneys. Tip: time it right! Claim your Medal, Santa’s Favourite Aide, for scoring more than 1000 points!